Holiday Gift Bundles + All Bases Dyed-To-Order Update!!! Big week here at TFA Headquarters! Here’s what you need to know: On Friday, November 16th the 2018 Gift Bundles will be available! I have already made the listings and you can check out all the details here. They say ‘sold out’ but that’s only because I don’t have the option of listing them as ‘not yet available’. On Friday at about 8am ET they will be available. Next on the list of exciting things that are happening this week is a BIG Dyed-To-Order Update that will conveniently also be happing on Friday, November 16th. I have purposefully scheduled the update for the same day as the Gift Bundles drop so you can combine shipping and I’m purposefully telling you all about it a few days in advance so you can do all your planning! The Dyed-To-Order update will be for ALL of our permanent collection colourways on ALMOST ALL OF OUR BASES! - Red Label will not be included unfortunately. After literally years of consideration I have decided to retire all of our non-PureWash bases after our annual Boxing Day Etsy Update. We are so passionate about our PureWash line of yarns, it’s where our hearts are and it’s what we want to focus on. We’re going in whole hog! It was an incredibly difficult decision, purely for selfish reasons since I love so many of our first generation bases and I’ll miss them! Retiring them completely feels a little sad, but I keep reminding myself that this free’s up space for me to continue developing more PureWash yarns! The truth is our current model of only having some yarns available full time and the rest available in the occasional update has made things overly complicated. I received an email just this morning from a customer inquiring about how to purchase Orange Label and even I was confused by my response. All that to say that Friday morning I will list all of our colourways in all of our bases for the very last time. You can order whatever you want and we will dye it up for you. The bases will remain available for about 48 hours or while quantities last! After this update we will take stock of what we have left in inventory and dye it all up for our Boxing Day Etsy Update. After that, they’re gone! The Gift Bundles are ready-to-ship, the rest will be dyed-to-order, if you order a Gift Bundle alongside a batch of Orange Label I’ll hold off and ship them all together. Everything will be ready to ship early December to arrive in time for the holidays. Let’s dive a little deeper into the Gift Bundles shall we? I LOVE this year’s bundle! I am constantly surprised and delighted by how well the Gift Bundles come together. It’s as though they were actually planned to be perfectly coordinated! Of course that’s always my hope but things go off on tangents and develop a life of their own but then somehow like magic when all these separate elements come back together they make perfect sense as a whole. • A beautiful note card designed by illustrator Katrinn Pelletier of Katrinn Pelletier Illustration. 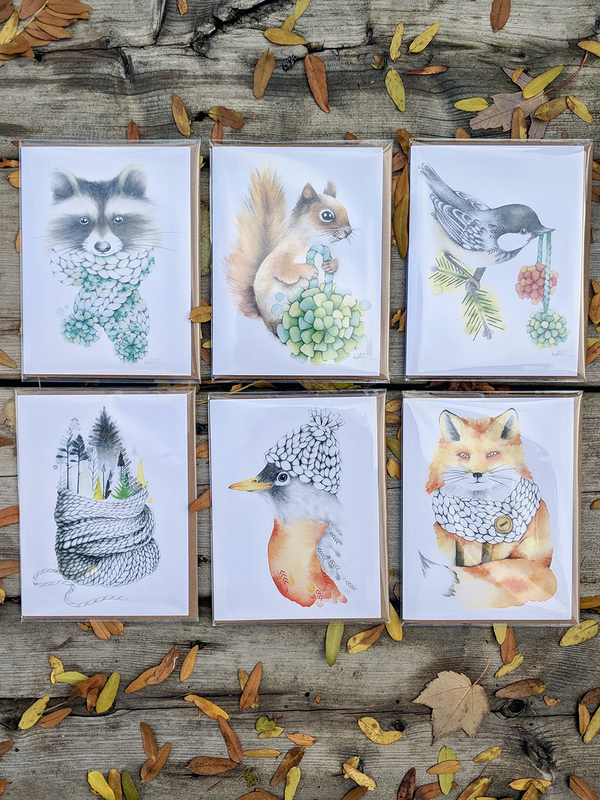 You will receive 1 of the 6 notecards pictured, if you have a preference for 1 design please leave a note in the comments and I’ll do my best to accommodate requests while supplies last. • A set of 21 Gold Geometric Stitch Markers. I love everything in this year’s bundle, but I obviously have a soft spot for those projects bags made by my mom Noreen with help from her friend Andrea. They are awesome! (‘They’ refers both to the bags and the dynamic duo who made them!) I love the understated but impactful use of colourful accents we chose. It feels quintessentially TFA to me. Mom has mastered the art of production boxy bag making, and I’m hoping to continue to put her skills to good use going forward. 3 cheers for my mom! The Gift Bundle exclusive Reflections colourway is a dream. It reminds me of Lotus, one of my favourite permanent collection colorulways, but it stands on it’s own as a dynamic speckle. With bits of gold, amber, turquoise and jade green over a veil aqua and grey, it’s my dream colourway. I will be casting on for a tiny Flax in this colourway pronto. It’s an exciting week indeed! I love this time of year. See you Friday!